We know how to get catering done right. 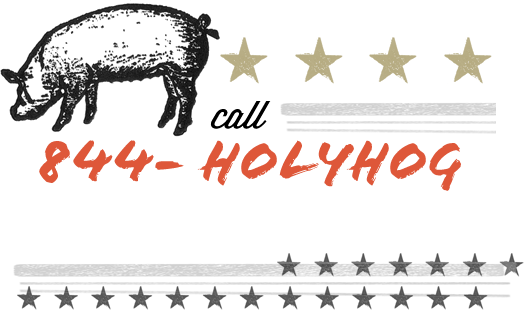 So, just sit back, relax, and let our Holy Hog Catering Team take care of things! We’ll help you choose from our selection of award-winning BBQ and scrumptious sides to make your party the best party yet. Don’t believe us? Well, maybe we’ll just let our home-style BBQ sauces do the talking. So, get started with our catering options below or call 1-813-879-4647. If your party or event needs more 'Q than what we've listed above, then you're speaking our language! Any event, large or small, is right up our alley. Below you'll find all the info and pricing needed to get started on your custom menu: pick 2 Meats, pick 3 Homestyle Sides, Texas Toast, and House BBQ Sauces. Contact us for a specialized quote for your event! $0.49 per dining set-up (fork, knife, spoon, plate, napkins). $10 per chafing set-up (wire chafer, H2O pan, fuel). $75 per server for two hours; $50/each additional hour.